This video demonstrates modulation of reflex activity, volitional strength and ambulation through clinical and quantitative assessments in individuals with motor incomplete SCI as a result of acute oral administration of a serotonin reuptake inhibitor (SSRI). Thompson, C. K., Jayaraman, A., Kinnaird, C., Hornby, T. G. Methods to Quantify Pharmacologically Induced Alterations in Motor Function in Human Incomplete SCI. J. Vis. Exp. (50), e2148, doi:10.3791/2148 (2011). Spinal cord injury (SCI) is a debilitating disorder, which produces profound deficits in volitional motor control. Following medical stabilization, recovery from SCI typically involves long term rehabilitation. While recovery of walking ability is a primary goal in many patients early after injury, those with a motor incomplete SCI, indicating partial preservation of volitional control, may have the sufficient residual descending pathways necessary to attain this goal. However, despite physical interventions, motor impairments including weakness, and the manifestation of abnormal involuntary reflex activity, called spasticity or spasms, are thought to contribute to reduced walking recovery. Doctrinaire thought suggests that remediation of this abnormal motor reflexes associated with SCI will produce functional benefits to the patient. For example, physicians and therapists will provide specific pharmacological or physical interventions directed towards reducing spasticity or spasms, although there continues to be little empirical data suggesting that these strategies improve walking ability. In the past few decades, accumulating data has suggested that specific neuromodulatory agents, including agents which mimic or facilitate the actions of the monoamines, including serotonin (5HT) and norepinephrine (NE), can initiate or augment walking behaviors in animal models of SCI. Interestingly, many of these agents, particularly 5HTergic agonists, can markedly increase spinal excitability, which in turn also increases reflex activity in these animals. Counterintuitive to traditional theories of recovery following human SCI, the empirical evidence from basic science experiments suggest that this reflex hyper excitability and generation of locomotor behaviors are driven in parallel by neuromodulatory inputs (5HT) and may be necessary for functional recovery following SCI. The application of this novel concept derived from basic scientific studies to promote recovery following human SCI would appear to be seamless, although the direct translation of the findings can be extremely challenging. Specifically, in the animal models, an implanted catheter facilitates delivery of very specific 5HT agonist compounds directly onto the spinal circuitry. The translation of this technique to humans is hindered by the lack of specific surgical techniques or available pharmacological agents directed towards 5HT receptor subtypes that are safe and effective for human clinical trials. However, oral administration of commonly available 5HTergic agents, such as selective serotonin reuptake inhibitors (SSRIs), may be a viable option to increase central 5HT concentrations in order to facilitate walking recovery in humans. Systematic quantification of how these SSRIs modulate human motor behaviors following SCI, with a specific focus on strength, reflexes, and the recovery of walking ability, are missing. This video demonstration is a progressive attempt to systematically and quantitatively assess the modulation of reflex activity, volitional strength and ambulation following the acute oral administration of an SSRI in human SCI. Agents are applied on single days to assess the immediate effects on motor function in this patient population, with long-term studies involving repeated drug administration combined with intensive physical interventions. To assess the effects of acute oral administration of an SSRI (10 mg escitalopram oxalate, Lexapro, Forest Pharmaceuticals, Inc.) on motor activity in individuals with motor incomplete SCI, a double-blinded, randomized, placebo controlled crossover design is employed. As part of the inclusion criteria, subjects will be required to undergo a 14 day washout period for all anti-depressant medications, anti-spastic medications and other medications with known interactions to the SSRIs. Two hours is required for each of the experimental protocols, consisting of clinical, quantitative static and quantitative dynamic assessments. A 4.5 hour delay is given following medication administration (time to peak plasma concentration)7. Subjects are re-tested following medication administration using an identical experimental set-up and paradigm employed during pre-medication testing. Following pre- and post-testing of the first medication (SSRI or placebo), a minimum of 7 days separates the two testing conditions (half-life of agents is approximately 27 hrs). Spasticity of the quadriceps and hamstring muscle groups is quantified using the Modified Ashworth Scale (mAsh). The individual is placed supine on padded mat. Spastic reflexes are graded on a 0-4 scale consisting of whole numbers in addition to a '1+' grade. The criteria for grading is based upon the table below (Table 1). To assess quadriceps spasticity, the patient's leg is raised off of the mat and fully extended by support under the thigh and ankle, with contralateral leg extended. A stretch is provided to the quadriceps by providing brisk passive flexion about the knee joint. The response to stretch is quantified in accordance to the scale below. To assess hamstring spasticity, the patient's leg is raised off of the mat and fully flexed by support under the thigh and ankle, with contralateral leg extended. A stretch is provided to the hamstrings by providing brisk passive extension about the knee joint. The response to stretch is quantified in accordance to the scale below. Raw scores are converted to an ordinal scale and summed bilaterally to gain a composite score. Spastic reflexes are graded on a 0-3 scale using whole numbers. The criteria for grading are based upon the table below (Table 2). To assess flexor spasms, both legs are fully extended with the patient's shoes and socks removed. A pin prick is applied for 1 second to the medial arch of the subject's foot. The magnitude of motion of big toe, knee and hip quantified in accordance to the scale below. To assess extensor spasms, the leg is supported in 90° of hip flexion and 110° of knee flexion, with contralateral leg extended. From this position the leg is briskly extended and laid to rest on the mat. The duration of visible quadriceps activity, noted by superior patella displacement, is quantified in accordance to the scale below. To assess clonus, the lower leg is lifted slightly from the mat and the ankle is placed in neutral to slight plantarflexion, with contralateral leg extended. A stretch to the plantarflexors is delivered via brisk passive dorsiflexion of the ankle. The duration of the clonic bursting is quantified in accordance to the scale below. Scores are summed within and between legs to obtain a composite score. The ability for an individual to volitionally contract muscles in accordance with myotomes is assessed using the ASIA Lower Extremity Motor Score (LEMS). Strength is graded on a 0-5 scale using whole numbers. The criteria for grading are based upon the table below (Table 3). The hip flexors (L2 myotome) are assessed by having the patient attempt to flex hip from the supine position, and manual resistance is provided as necessary. If the patient is unable to fully move against gravity, the hip is externally rotated to lessen the effects of gravity and hip flexion is attempted again. The knee extensors (L3 myotome) are assessed by having the patient attempt to extend knee from a flex position, pivoting about the examiners forearm, and manual resistance is provided as necessary. If the patient is unable to fully move against gravity, the hip is externally rotated to lessen the effects of gravity and knee extension is attempted again. The ankle dorsiflexors (L4 myotome) are assessed by having the patient attempt to dorsiflex ankle with the leg extended, manual resistance provided as necessary. If the patient is unable to fully move ankle against gravity, the hip is externally rotated to lessen the effects of gravity and ankle dorsiflexion is attempted again. The great toe extensors (L5 myotome) are assessed by having the patient attempt to extend the great toe with the leg extended and the ankle plantarflexed, manual resistance is provided as necessary. If the patient is unable to fully move toe against gravity, the hip is externally rotated to lessen the effects of gravity and great toe extension is attempted again. The ankle plantarflexiors (S1 myotome) are assessed by having the patient attempt to plantarflex with the leg extended with manual resistance is provided as necessary. If patient is unable to move ankle through full range with resistance, the hip and knee are flexed to place the plantar surface of the foot on the mat and the patient is asked to rise up on their toes. If patient is unable to fully rise up on their toes, the hip is externally rotated to lessen the effects of gravity and ankle plantarflexion is attempted again. Lower extremity motor score is calculated by adding results for each muscle group bilaterally. Using isokinetic dynamometers in addition to electromyography (EMG), a precise stretch can be applied and a quantitative response can be assessed. Surface EMGs are applied to the soleus and medial gastrocnemius. Leg is attached to foot plate coupled to a 6 degree of freedom load cell (ATX Industrial Automation, Apex, NC) and ankle joint axis is aligned to the center of the load cell. To quantify torque response, torque signals are filtered at 200Hz, sampled at 1000 Hz and synchronized with EMG data. Passive and gravitational torques are obtained from the slow stretch perturbations (5 deg/sec) and subtracted from the rapid stretches to calculate the reflex response. Stretches are segmented for each DF and PF excursion, minimum and maximum torques are identified, and peak torque is defined as the difference in the values. To quantify EMG response, EMG signals are filtered at 20-450Hz, sampled at 1000 Hz, synchronized with torque data. The signal is rectified and smoothed at 10 Hz low-pass using a 4th order recursive Butterworth filter, and the area of the smoothed signal is calculated for agonist and antagonist for all excursions. For perturbations, EMG is often present following cessation of movement during the final hold position. Integrated EMG area is calculated, starting from the beginning of the final joint rotation extending into the hold phase for up to 3 seconds. Precise quantification of volitional strength can be obtained using an isokinetic dynamometer. The individual is comfortably seated in testing apparatus. Surface EMGs are affixed to 6 major muscle groups of each leg including rectus femoris, medial hamsting, vastus lateralis, tibialis anterior, soleus and medial gastrocnemius (Delsys 2.1, Boston, MA). Leg is attached to foot plate coupled to a 6 degree of freedom load cell and knee joint axis is aligned to the center of the load cell. With the patient relaxed, the patient is instructed to generate maximal force. To ensure maximal volitional force production, vigorous verbal encouragement is provided to the patient by the experimenters. When the torque begins to decline, super maximal stimulus is delivered to the agonist (10 pulses, 600 μs duration, 100 Hz, 135 V; S48 Grass, West Warwick, RI) through 3" x 5" self-adhesive, gel plate stimulating electrodes (ConMed Corp, Utica, NY). Torque and EMG are collected and conditioned as in the velocity dependent stretch (step 2). To quantify maximal torque response, peak torque of the smoothed signal is found. Maximal torque is defined as the average torque produced ±50ms of peak torque. To quantify EMG response, maximal EMG is calculated as the average signal present 0 to 100ms prior to peak torque. Functional ambulation is assessed using a graded treadmill test to obtain treadmill speed. The subject begins to walk on the treadmill at 0.1 m/s. Speed is speed increased every 2 minutes by 0.1 m/s. Maximal speed obtained for at least 1 min, is recorded as peak treadmill speed. During treadmill walking multiple kinematic measures including, peak range of motion, peak velocity and variability are assessed using motion capture system (Motion Analysis, Santa Rosa, CA). The consistency of intralimb coordination between the hip and knee joints is quantified by calculating the average coefficient of correspondence (ACC; 10). The ACC uses a vector coding technique to analyze the sagittal-plane hip and knee angles on an angle-angle plot. Motion capture cameras are calibrated per manufacturers' recommendations prior to each use. During data collection, data is sampled at 100 Hz from 6 cameras. Offline, the motion capture data is manually tracked for accuracy and an epoch of at least 10 step cycles at the fasted speed obtained in either pre of post SSRI are isolated for analysis. 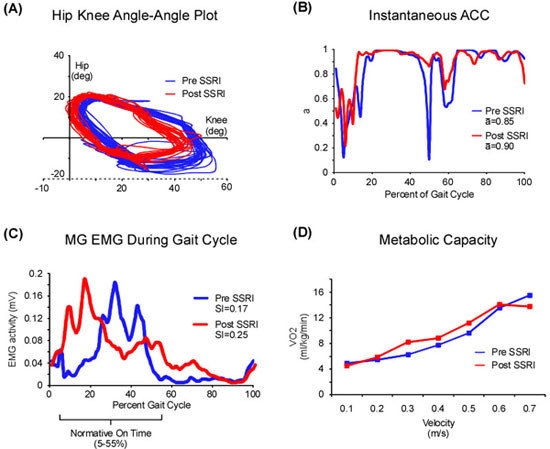 Gait cycle is normalized to percent from heel strike to heel strike and interpolated using a cubic spline for both the hip and the knee angles. Hip knee angle-angle plot is constructed (Figure 3a). The average cosine and sine of hip (x) and knee (y) normalized to vector length (l) respectively for each frame-to-frame interval calculated across all steps isolated for analysis (Equation 1-2). The mean vector for each frame-to-frame interval is calculated using the average frame-to-frame sine and cosine values across all steps isolated for analysis (Equation 3). The mean vector (a), represents the continuous variability of changes in the frame-to-frame interval or the consistency of intralimb coordination between the hip and knee joints over multiple step cycles (Equation 4). When a=1 the cycle is perfectly consistent with values less than 1 indicating progressively less intralimb consistency between steps (Figure 3b). Muscle activity during gait is quantified using EMG signals. To collect EMG responses, EMG signals are hardware filtered at 20-450Hz, sampled at 1000 Hz, while synchronized with motion capture data. Off line, signals are highpass filtered at 30Hz to remove movement artifact full wave rectified and low-pass filtered at 20 Hz using a 4th order recursive Butterworth to create a linear envelope. Smoothed EMG signals are normalized to the percent gait cycle and averaged between at least 10 steps at the fasted speed obtained in either pre of post SSRI. Normative values of muscle activity are established using a database of healthy controls to establish normative on times and off times. The table below presents the normative activity of the 6 muscles throughout the gait cycle. Normative on time and off times for each muscle are overlaid on the EMG signals collected from the subject. The integrated area of the on time and off time are calculated. The spasticity index (SI) is calculated through Equation 5 11. Representative results are shown in Figure 3c. Cardiorespiratory/metabolic capacity is assessed using measures of peak oxygen uptake (VO2peak; mL/kg/min) during graded treadmill testing using a K4b2 portable metabolic system (Cosmed USA Inc., Chicago IL). Metabolic system is calibrated in accordance with manufacturers' recommendations and affixed to patient. Baseline measurements of VO2 are obtained in a seated position for a minimum of 2 minutes and then again in a standing position for a minimum of 2 min. An internal user controlled mark on the metabolic system is used to sync events. While walking on the treadmill the VO2 is collected with manual marks provided by the experimenter with increases in speed (every 2 min). After the treadmill test, the data is downloaded to a personal computer for further analysis. VO2 data is analyzed by averaging the last minute of each 2 minute speed epoch and plotted for each speed (Figure 3d). Figure 1. Following oral administration of SSRI in an individual with motor incomplete SCI there are notable alterations in clinical measures of motor activity. 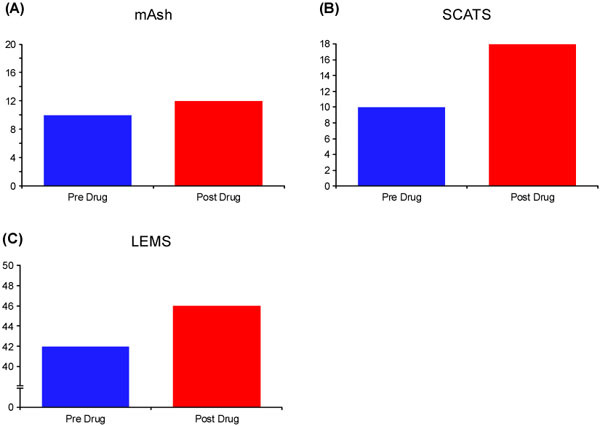 Both measures of involuntary reflex activity, mAsh (A) and SCATS (B) increased to varying degrees, suggesting the two clinical scales may be capturing a different aspect of the augmented involuntary activity. (C) Additionally, clinically detectable changes in volitional strength are observed following SSRI administration. Figure 2. Following oral administration of SSRI in an individual with motor incomplete SCI there are notable alterations in quantitative static measures of motor activity. (A) Augmented and prolonged ankle plantarflexion torque and EMG are observed in response to repeated stretches of the plantarflexors following SSRI administration. Increased isometric torque is seen following SSRI administration. Interestingly, there is less activation deficit (greater CAR) following SSRI administration, indicating the individual is able to more fully activate their muscle during a maximal volitional contraction following SSRI administration. Figure 3. Following oral administration of SSRI in an individual with motor incomplete SCI there are alterations in quantitative dynamic measures of motor activity. Analyses of variability of hip and knee kinematics (A) during ambulation using ACC (B) reveals that there is an increased consistency following SSRI medication, both pre and post measures are at 0.7 m/s. (C) Analysis lower extremity EMG activity during ambulation reveals an increase in inappropriate timing of muscle activity following SSRI medication, both pre and post measures are at 0.7 m/s. (D) Analysis of metabolic parameters during ambulation reveals a modest increase in O2 consumption during the graded treadmill test following SSRI administration. This video demonstration highlights methods to assess changes in reflex activity, volitional strength and ambulation following the acute oral administration of SSRIs in human SCI. This battery of assessments demonstrates that despite increases in so called abnormal reflex activity following acute oral administration of a SSRI, the individual with SCI demonstrated improvements in volitional strength, with only minor changes in locomotor ability. In these individuals the effects of augmented spasticity do not appear detrimental to ambulatory function. Additionally improvements in walking ability may be more pronounced in individuals with acute lesions. Continuing studies use these similar quantitative and clinical assessments to determine the efficacy of combined SSRIs and intensive physical interventions, as has been employed in animal models of SCI. With a sound theoretical framework based on long-standing and relatively new basic science research, these methods can help translate such information to a clinical population and may challenge some of the traditional protocols used in clinical practice to augment functional recovery in individuals with SCI. Miller, J. F., Paul, K. D., Rymer, W. Z., Heckman, C. J. 5-HT1B/1D agonist CGS-12066B attenuates clasp knife reflex in the cat. J Neurophysiol. 74, 453-456 (1995). Gimenez y Ribotta, M. Kinematic analysis of recovered locomotor movements of the hindlimbs in paraplegic rats transplanted with monoaminergic embryonic neurons. Ann N Y Acad Sci. 860, 521-523 (1998). Landry, E. S., Guertin, P. A. Differential effects of 5-HT1 and 5-HT2 receptor agonists on hindlimb movements in paraplegic mice. Prog Neuropsychopharmacol Biol Psychiatry. 28, 1053-1060 (2004). Liu, J., Jordan, L. M. Stimulation of the parapyramidal region of the neonatal rat brain stem produces locomotor-like activity involving spinal 5-HT7 and 5-HT2A receptors. J Neurophysiol. 94, 1392-1404 (2005). Fong, A. J. Spinal cord-transected mice learn to step in response to quipazine treatment and robotic training. J Neurosci. 25, 11738-11747 (2005). Murray, K., Nakae, A., Stephens, M. J., Rank, M., D Amico, J., Harvey, P., Li, X., Harris, L., Ballou, E. W., Anelli, R., Heckman, C. J., Mashimo, T., Vavrek, R., Sanelli, L., Gorassini, M. A., Bennett, D. J., Fouad, K. Recovery of motoneuron and locomotor function after chronic spinal cord injury depends on constitutive activity in 5-HT2C receptors. Nature Medicine. Forthcoming (2010). Pariente, J. Fluoxetine modulates motor performance and cerebral activation of patients recovering from stroke. Ann Neurol. 50, 718-729 (2001). Hornby, T. G., Lewek, M. D., Thompson, C. K., Heitz, R. Repeated maximal volitional effort contractions in human spinal cord injury: initial torque increases and reduced fatigue. Neurorehabil Neural Repair. 23, 928-938 (2009). ACSM's Guidelines for Exercise Testing and Prescription. 6th edn, Lippincott, Williams & Wilkins. (2000). Lewek, M. D. Allowing intralimb kinematic variability during locomotor training poststroke improves kinematic consistency: a subgroup analysis from a randomized clinical trial. Phys Ther. 89, 829-839 (2009). Fung, J., Barbeau, H. A dynamic EMG profile index to quantify muscular activation disorder in spastic paretic gait. Electroencephalogr Clin Neurophysiol. 73, 233-244 (1989). Bohannon, R. W., Smith, M. B. Interrater reliability of a modified Ashworth scale of muscle spasticity. Phys Ther. 67, 206-207 (1987). Benz, E., TG, H. ornby, RK, B. ode, Scheidt, R. A., Schmit, B. D. A physiologically based clinical measure for spastic reflexes in spinal cord injury. Arch Phys Med Rehabil. 86, 52-59 (2005). Excellent. I wish I can download the videos..please.